I read the original “Ender’s Game” short story when it was published in Analog (August 1977). I was startled, because I knew the author, Orson Scott Card, slightly. He and I attended Brigham Young University at roughly the same time (he was a year ahead of me), I had met him a few times, and I knew him primarily as a playwright; I had even attended one of his plays (“Father, Mother, Mother, Mom”). I had no idea he was “dabbling” in science fiction. When I saw the novel-length version of “Ender’s Game” in a bookstore (City Lights Booksellers) in San Francisco several years later (1985), I groaned a bit; I had seen other authors take short stories and expand them to novels, and they seldom held up well. The novel “Ender’s Game” was, instead, a counter-example to that trend: stronger, deeper, more emotionally engaging. It went on to with the “Best SF Novel” category in both the Hugo (fan-voted) Awards and the Nebula (writer-voted) Awards. 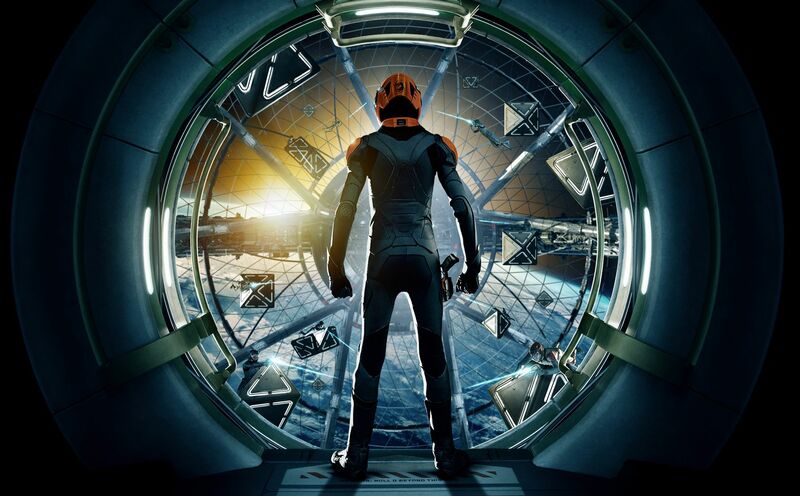 At some point many years ago, the movie rights were initially purchased, and “Ender’s Game” (the movie) went into what it commonly called “development hell” — never quite finding the right combination of studio, producers and director to get itself made, until just the past few years. I went into the film today with some trepedation; I have seen time and again what Hollywood has done to the science fiction/fantasy genre in general, and adaptations of material from that genre in particular. Beyond that, I was a touch underwhelmed by the trailers for the film — they were mostly whiz-bang and did little to convey the emotional depths and darkness of the novel. But my wife and I, along with our youngest (almost 28) daughter Salem, went to see the IMAX version today. The first fifteen minutes of the film didn’t ease my concerns that much. The exposition was a touch clunky, and it was hard seeing past Harrison Ford the-action-hero to see himself instead as Col. Graff. But then one of the early scenes at the Battle School took place — one with Ender (Asa Butterfield) questioning both Graff and Sgt. Dap — that ended with Sgt. Dap saying, “I will never salute you [as a commander]”, and Ender replying (while doing pushups), “Yes, you will.” — and from that point on, I totally bought Butterfield as Ender. The rest of the movie moved very quickly, if anything a bit too quickly. The film clocks in at just under 2 hours, which is probably as long as the studio dared make it — but I think it could have used another 20-30 minutes (and I hope for an extended director’s cut in the video release). The movie was engrossing, moving, and spectacular, particularly on the IMAX screen. It is also remarkably faithful to the novel; the few changes made were done for understandable reasons. I even eventually bought Ford as Graff, though I think that role would have been better played by someone with less accrued heroic aura — say, James Spader (who would have been both more chilling and more world-weary in that role, in my opinion). My other great relief is that there was no Hollywood stupidity — no romance between Ender and Petra (but a touching, awkward friendship), no sugar-coating outcome of Ender’s final decisions. I will likely go see it at least once or twice more while it’s still in the theaters, something I hardly ever do. Highly recommended. Your mileage may vary. Spoilers after the jump. My single biggest criticism of the film is that it did not — in my opinion — do a proper job with the Command School segment. It could have used just a minute or two more to more clearly establish that Ender thought he was fighting simulations against Mazer Rackham (played excellently by Ben Kingsley), and that they were battles that he kept losing, with him and his key ‘toon leaders burning out. The biggest omission was that in the novel, for the final “simulation”, Ender is specifically told he cannot attack the home world, but has to defeat the enemy fleets while leaving the home world untouched. When he and his subcommanders see the size of the enemy fleets, they are overwhelmed to the point of hopelessness. That’s when Ender decides that he’s going to get himself kicked out and buy relief for his friends by deliberately disobeying that directive to spare the home world; instead, he carefully guides the “Dr. Device” weapon (called the “Little Doctor” in the film) to a close-enough point and destroys the home world. Of course, the adults were hoping all along that he’d do that, but they needed to keep their hands clean of the potential xenocide. So when Ender afterward expects reprimand and dismissal, instead the adults hail him as a conquering hero — and he realizes the enormity of what he’s done. That original sequence, as written in the novel, ties in very well with the prior attacks that Ender has experienced, with him killing an Earth schoolmate and a fellow Battle School commander, both at times when he felt he had no other option for survival. I think that would have greatly increased the emotional punch of that sequence, as would the subsequent revelation that people back on Earth, after initial praise, turn on Ender and see him as a genocidal commander. That is as much a reason as any why Ender does not return to Earth, but that doesn’t come out in the film. That’s my main complaint. Again, highly recommended, and I hope this sets up Scott and his family financially for life. ..bruce w..